Afr. J. Environ. Sci. Technol. 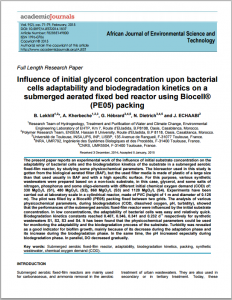 The present paper reports an experimental work of the influence of initial substrate concentration on the adaptability of bacterial cells and the biodegradation kinetics of the substrate in a submerged aerobic fixed-film reactor, by studying some physicochemical parameters. 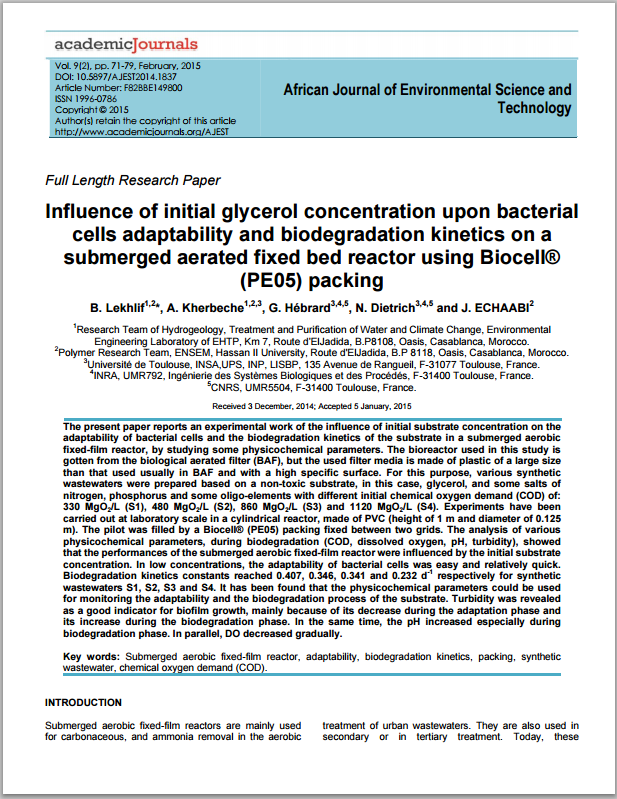 The bioreactor used in this study is gotten from the biological aerated filter (BAF), but the used filter media is made of plastic of a large size than that used usually in BAF and with a high specific surface. For this purpose, various synthetic wastewaters were prepared based on a non-toxic substrate, in this case, glycerol, and some salts of nitrogen, phosphorus and some oligo-elements with different initial chemical oxygen demand (COD) of: 330 MgO2/L (S1), 480 MgO2/L (S2), 860 MgO2/L (S3) and 1120 MgO2/L (S4). Experiments have been carried out at laboratory scale in a cylindrical reactor, made of PVC (height of 1 m and diameter of 0.125 m). The pilot was filled by a Biocell® (PE05) packing fixed between two grids. The analysis of various physicochemical parameters, during biodegradation (COD, dissolved oxygen, pH, turbidity), showed that the performances of the submerged aerobic fixed-film reactor were influenced by the initial substrate concentration. In low concentrations, the adaptability of bacterial cells was easy and relatively quick. Biodegradation kinetics constants reached 0.407, 0.346, 0.341 and 0.232 d-1 respectively for synthetic wastewaters S1, S2, S3 and S4. It has been found that the physicochemical parameters could be used for monitoring the adaptability and the biodegradation process of the substrate. Turbidity was revealed as a good indicator for biofilm growth, mainly because of its decrease during the adaptation phase and its increase during the biodegradation phase. In the same time, the pH increased especially during biodegradation phase. In parallel, DO decreased gradually. Key words: Submerged aerobic fixed-film reactor, adaptability, biodegradation kinetics, packing, synthetic wastewater, chemical oxygen demand (COD).